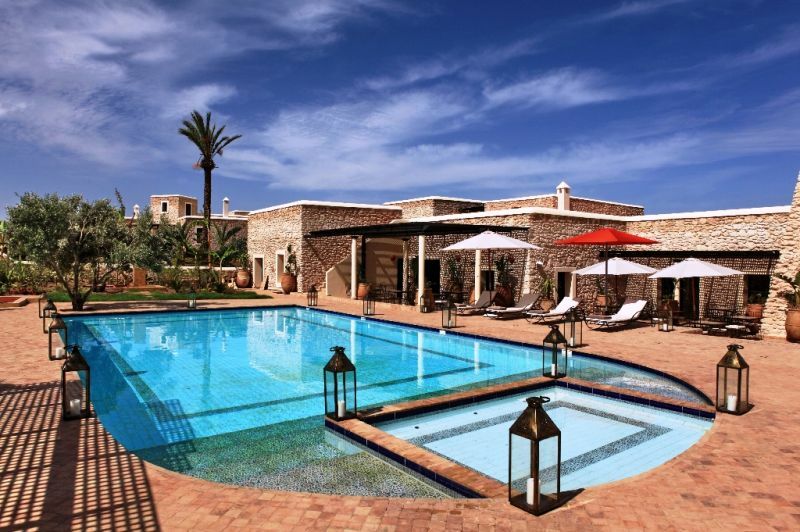 Luxury detox and healthy eating Yoga Holidays in Morocco. Our 6 day Yoga Holidays programme offers healthy eating through our nourishing cooking classes, yoga and swimming located within luxury accommodation and nature. Submerge yourself in a peaceful detoxifying environment, deepen your yoga practice, learn about & healthy cooking with locally sourced ingredients infused with Moroccan flavour and spices. 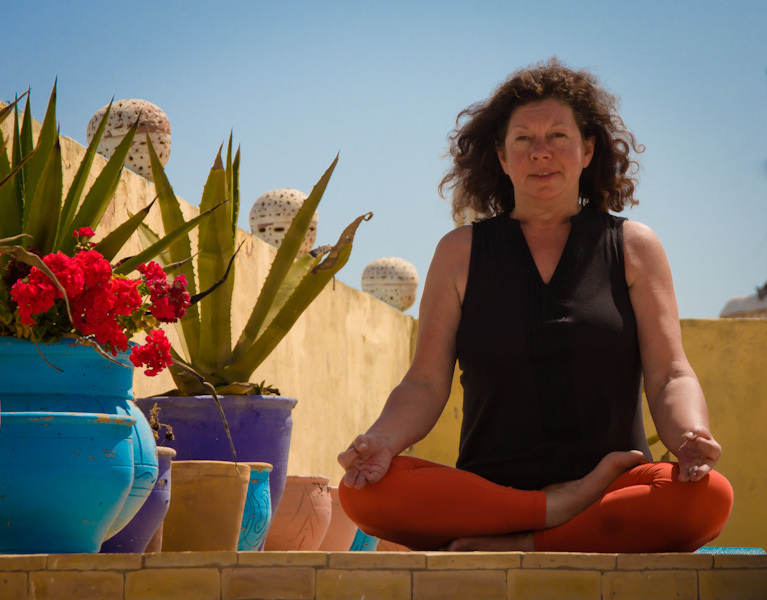 Cleanse and relax in Morocco on one of our yoga holidays with a week’s emphasis on relaxing and relieving the stresses and strains of life back home. After a week at this magical oasis with us you’ll feel renewed, refreshed, and rejuvenated. A peaceful haven welcomes you in the wonderland of the Moroccan countryside. The view of the surrounding gardens, pine forests and olive trees is a perfect setting to start off your day of yoga & well-being. You’ll be led through two daily yoga classes with one of our our resident Yoga teachers, Jo or Maria, including meditation sessions and breathing techniques and whether you are new to yoga or deepening your existing practice, you’ll gain a stronger awareness of your mind, body and spirit connection after your Morocco Yoga and cooking Holiday. Naima, our cooking holidays chef here in Essaouira will have your taste buds watering during your two healthy eating themed Moroccan cookery classes at a nearby countryside location. You’ll go home with a new relationship to food and the desire to eat clean. 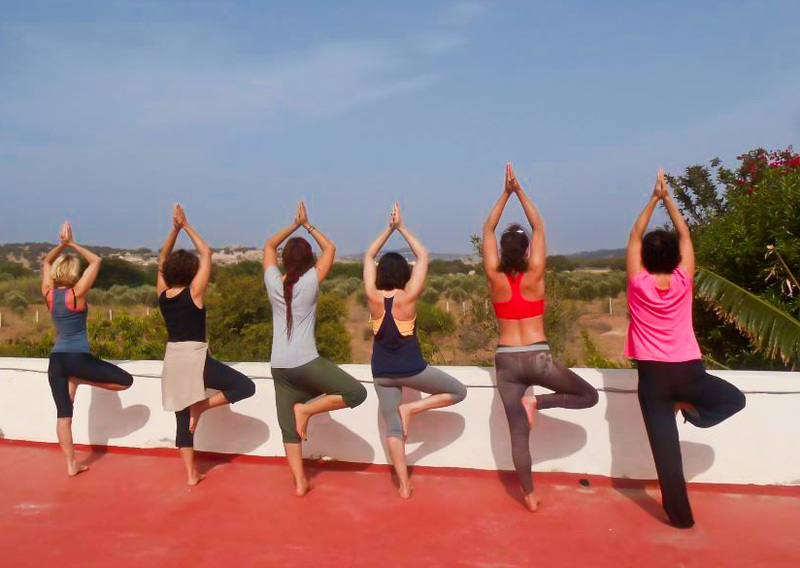 THE LOCATION for our Moroccan Yoga Holidays is in the hillside of Essaouira 15 mins from the medina. There are several shuttle buses running each day in to Essaouira’s medina if you want a little more hustle and bustle. The property is landscaped with many lawns and gardens which will delight lovers of nature. The Main Villa features a large indoor dining area, communal seating lounge and many spaces to sit, read, relax and enjoy the Moroccan sun. The Main Villas house 4 large beautifully decorated bedroom suites with a lounge and kitchen. Each villa has its own private gardens and swimming pool. The outdoor vista includes a refreshing heated swimming pool with lounging spaces for sun bathing. There is a Yoga space available at the Lodge. 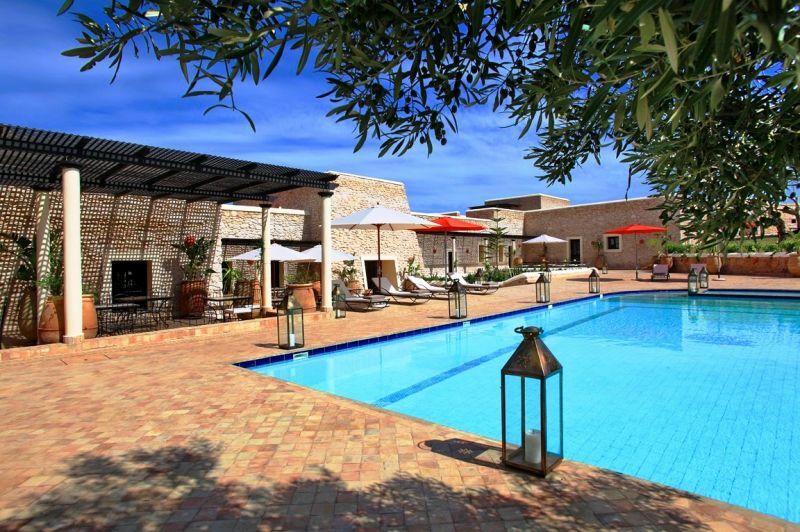 The surrounding area of Essaouira is an unspoiled community that will delight your senses. It’s famous port area is an attraction to both tourists and local shoppers. The medina (market area) will have you feeling as though you’ve been transported to another time. Whether you are looking for a hand crafted rug, Moroccan lighting, jewelry, leather goods, furniture, food, or local artisan goods, it’s all waiting for you here. Six nights comfortable accommodation in a private luxury villa or apartment. Your own en-suite room. No sharing. 2 cooking classes in Moroccan cooking. 4 evening meals at the hotel. All food is locally sourced in Morocco. 2 evening meals at restaurants in Essaouira with vegetarian food options. Two yoga classes per day in the garden or inside. A guided shopping tour in Essaouira in tis relaxing souks (market). As the sun rises, you will be led through a daily guided morning meditation in yoga tent overlooking the tranquil gardens. Your morning yoga asana and pranayama (yogic breathing) class, will awaken and energize you. Jo is a fully qualified Yoga teacher with over 20 years experience instructing in the UK and her main specialisms are asana and pranayama. She’s also qualified to teach pregnancy classes in Yoga. Whether you are an experienced yoga practitioner or blossoming into your practice, you will learn to move with awareness, strength and balance. Your two daily yoga asana classes will be catered to your specific body needs and will range from Hatha to Yin, to Restorative to flowing Vinyasa. The Yoga Holidays are focused around healthy eating so no bread or diary and instead plenty of fruit and vegetables. During this yoga and cooking holiday you will get the chance to learn how to make your own healthy Moroccan dishes by taking part in cooking workshops. Naima will personally introduce you to methods on how to create delicious versions of dishes that may sound familiar but have never tasted so good such as prawn & parsley soup, couscous salad and lentil dal. You will receive your own recipes to take home. optional departure day and extra Fri night for Essaouira flights. TO MAKE YOUR RESERVATION FOR 6 NIGHTS IN LUXURY ACCOMMODATION AT £850 / € 1150. SELECT A PREFERRED DATE FOR YOGA IN ESSAOUIRA, MOROCCO. If you have any questions or special requirements, do let us know.